Professional golfer cites California tax policy as cause for dire outlook for his personal finances despite tens of millions in earnings. A Monday story in the UT-San Diego told an interesting tale of the hardships faced by professional athletes living in California. These poor guys just don’t make enough money to survive, it seems, because the state and federal governments are taxing them to death! I kid, of course, but apparently the passage of Prop 30 in last November’s election is enough to make some of California’s wealthier residents consider looking for someplace else to call home. Phil Mickelson, one of the world’s top professional golfers and a San Diego native—and local hero the stature of Tony Gwynn and the late Junior Seau—lamented in a press gaggle at a tournament in Palm Springs over the weekend that he was going to have to make some “drastic changes” in his lifestyle because of the way his rate of taxation is going up. He even decided to drop his bid to become part of the ownership group that recently purchased the San Diego Padres because of it. Poor guy figured that he couldn’t afford to invest $25 million of his estimated $250 million fortune (according to sports radio shock jocks Scott Kaplan and Billy Ray Smith of The Mighty 1090—not exactly rock solid sources, I know, but for the purposes of this column complete accuracy isn’t really necessary to make a point) because of how the recent fiscal cliff deal and the changes brought about by Prop 30 were going to affect his income tax rates. Pitiable Phil, according to Forbes, only earns $47.8 million per year in endorsements and winnings on the golf course. He’s the seventh highest paid athlete in the world. Tough to make ends meet that way. In the UT story, Mickelson is quoted as worrying that his tax rate will be “62 or 63 percent” because of the new laws on the books, and because of that he’s going to have to make some drastic life changes. If it sounds too sensational to be true, it is. For a couple of reasons, and this is why you shouldn’t listen to uber rich Californians when they complain that they are being taxed to oblivion. No, his tax rate won’t reach 62 or 63 percent. Crunch the numbers and at most he’ll reach just over 52 percent, which is a lot, but still a lot less than he assumes. Assuming he is taxed the full 39 percent on federal income taxes and the full 13.3 percent in state income taxes, a rough estimate says that he’ll still pocket a cool $22.4 to $22.8 million, depending on how it’s calculated. Not exactly pocket change by the average worker’s standards. And there’s the other bugaboo: No one with a decent accountant (and considering he earns $47.8 million he can afford a really good accountant) will be paying the full 39 percent in federal income taxes. His effective rate after all of the deductions his accountant will find will certainly be less than 30 percent, probably hovering around 25 percent at most. Mickelson’s take home pay just went up significantly. Side note: $43 million of Mickelson’s earnings come from endorsements, $4.8 million from winnings on the golf course. The endorsement income would be taxable for state income tax purposes, given that he claims California as his primary residence. Of the $4.8 million in winnings, however, only those earned in California based tournaments would be subject to state income taxation, which further damages the credibility of his statements. Edit: I forgot that state income taxes are deductible from federal income taxes. So part of Mickelson’s problem is solved right there. That brings his effective tax rate down to 50% at most, and considerably less once all of his deductions and considerations for capital gains income are factored in. Ok, so enough of skewering poor Phil. Somehow I think he’ll survive, even if he does decide not to move his family out of his Rancho Santa Fe home (didn’t he used to live in Arizona?). There is a larger point to be made despite the tone deafness of certain maligned individuals. And that point is this: Revenues in the State of California had to be increased, and the voters spoke loud and clear when they decided to not only raise the marginal tax rates on the wealthiest state residents, but to raise the state sales tax, effectively spreading the pain to EVERYONE in the state, among other measures. We are all presumably aware of the budget problems this state has suffered for the past several years. At one point California faced a budget deficit of over $25 billion. In response, Governor Jerry Brown (a Democrat, mind you) went on an austerity spree, cutting spending like a drunken accountant. Our schools were decimated, our state health programs and support programs for the poor were cut to the bare bones; our state parks were nearly shuttered. Schools were the hardest hit, and it was only going to get worse. There’s only so much you can cut before you do real damage to people’s lives, and serious damage to the state’s long term economic prospects. When you skimp on education—California currently ranks 47th in the nation in test scores for math and science and 43rd in per student spending—you eventually reach the point where our schools can no longer adequately prepare their students to productively contribute to growing the state’s economy. And let’s not even get started on higher education, which saw massive tuition spikes to the Cal State and UC systems, and massive cutbacks in the community college systems, putting a college degree out of reach for far too many. So the voters wisely decided that enough was enough. Austerity measures had stabilized the state’s finances, but long term they were going to do more damage than good. Voters passed Prop 30 pretty convincingly. Californians saw what was happening to their state and decided they had to swallow a bitter pill and do something about it, because their State Legislature sure wasn’t going to (Republicans still had the ability to block revenue bills because Dems lacked a full 2/3 majority in both houses of the Legislature, something the 2012 election took care of). Because of the new revenues generated by Prop 30 and Prop 39 funding is being restored to our schools, our university systems may be able to halt tuition hikes (and maybe, just maybe roll back some of the ones already instituted? ), and money can be put back into our state healthcare systems via participation in Obamacare’s expansion of MediCal (California’s version of Medicaid). With a proposed budget of $97.7 billion for the upcoming fiscal year, the state’s Legislative Analyst’s Office has projected a modest deficit of $1.9 billion, which, considering where we’ve come from is a major step in the right direction. “At this time we’d normally be sitting around talking about 20, 25, 30 billion dollar deficits,” said state budget analyst Mac Taylor. According to the California Budget Project, the governor’s proposed budget also features measures to pay down California’s current $28 billion debt, which includes $1.9 billion to restore deferred payments to our school systems. If Governor Brown’s plans hold in place, the state’s debt will be reduced to $5 billion by the 2016-17 fiscal year, down from $35 billion in 2010-11. That ain’t chopped liver. Beyond the 2013-14 fiscal year, the state is projected to run budget surpluses, assuming another economic calamity doesn’t strike, like, say, Congress refusing to raise the debt limit or other shenanigans in D.C. The point is that while we’re not completely out of the woods as a state, we are looking to be in far better shape than we’ve been in nearly a decade. And it’s amazing that it took a Democratic governor going around Legislative Republicans’ obstruction to accomplish it (because Republicans are supposed to be the fiscally responsible ones, right? ); it took an increase in the amount that we as Californians pay in taxes to accomplish it, in addition to continued belt tightening measures. California by itself has the eighth largest economy in the world, and there’s no reason we shouldn’t be able to manage our own finances effectively. Without the projected revenue increases from Props 30 and 39, California would still be in deep doo-doo budget wise (yes, that’s a technical term). With it, we are back approaching sound financial footing for the foreseeable future. 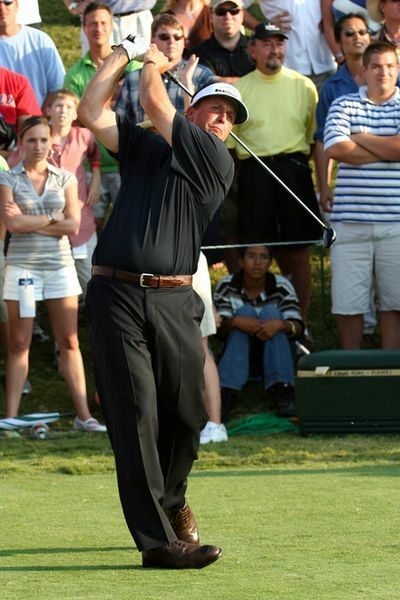 So with all due respect to Phil Mickelson and people like him, he can go get stuffed. He’s doing pretty well for himself—far better than the average Californian. And his personal financial outlook isn’t nearly as dire as he predicts. Long term the austerity measures Governor Brown and the Legislature had implemented were going to cripple the state’s economy. A small increase in Mickelson’s state income taxes was necessary to ensure continued economic growth, and the numbers prove it beyond question. And if he doesn’t like it, he certainly has the option of moving back to Arizona. I’m sure Governor Brewer would welcome him with open arms. « I’m Supposed to Feel Sorry for Phil Mickelson? Oops! I missed the fact that state taxes are deductible from your federal taxes, which pushes Mickelson’s tax rate even lower. According to this Deadspin story, where they checked with a tax expert, assuming zero deductions, the most he would pay would be around 50%, not 52% like I assumed. And as I noted, his effective rate will be far lower assuming his accountant has half a brain. How dare you challenge teahadist orthodoxy about “Taxifornia”! Word on the street is that ol’ Phil isn’t the sharpest tool in the shed, if you know what I mean. It’s possible that he actually believes that stuff. It’s more possible that his current “tax expert” is soaking him for some mighty big fees for mighty small advice. I think it is only fair that we at the SDFP point it out to Phil that he is being jerked around by his balls – and not his golf ones! It’s a strange sound, the whining of multimillionaires. But very instructive to those of us down here on the ground. For instance, it teaches me that no matter how much money’s up there, tempting the high flyers to grab more and more and more and more of it, life is bigger than another private jet or island. That accountants are waiters are the cable installers are the mechanics of wealth, and for that reason so very necessary. The only thing that scares me is that when Jerry Brown balances the budget, and the state escapes the Great Recession, will it be able to trade Mickelson’s position in the economy with that of the many thousand or so who could live quite comfortably on his endorsement money alone. I’d bet one of those 1500 people who’ll come in to take his place have something more to give back to California than Mickelson does. And what about his ROI? That’s Return On Investment. You don’t think his $150 million in net wealth or assets is just sitting around doing nothing do you? I’m sure he has a lot of it invested in the stock market which has been doing pretty good lately. He might even own a few apartment buildings and sucking in a lot of rent. And then there are those dividends. The very wealthy have lots of options for making money without ever having to go to the horrific effort of swinging a golf club. If he is making a 5% return on his wealth, he’s probably raking in at least $10 million there. All that is subject to taxation of course unless he has tax free municipal bonds. And the guy probably has tax shelters in the Cayman Islands as well. Whining like this from talented individuals gives meritocracy a bad name. Personally, I could care less about the game of golf and, if I were dictator, he could take his balls and go home. Phil must have some really poor accountants and lawyers if he’s paying anywhere near what he claims. He needs to fire them and hire Mitt “13%” Romney’s “it’s all legal” advisors. Mitt’s worth 100’s of millions, Phil must feel like a chump.